Some Jimmy Buffett's Margaritaville locations may be a bit cookie-cutter, but the Montego Bay, Jamaica location is far more unique, perhaps owing to the dark, moody atmosphere of the place. By day, it's a restaurant, well-lit, open and airy, but night closes in and churns it into a throbbing mecca for all things Jamaican, up to and including some pretty racy dancing, embraced by locals and tourists alike. The MoBay Margaritaville was opened in 1995 by Jamaican owners Brian Jardim and Ian Dear and hasn't stopped offering fun by the glass since, including some 52 tropical-flavored margaritas and the signature 22-ounce bongs of beer. No kidding. 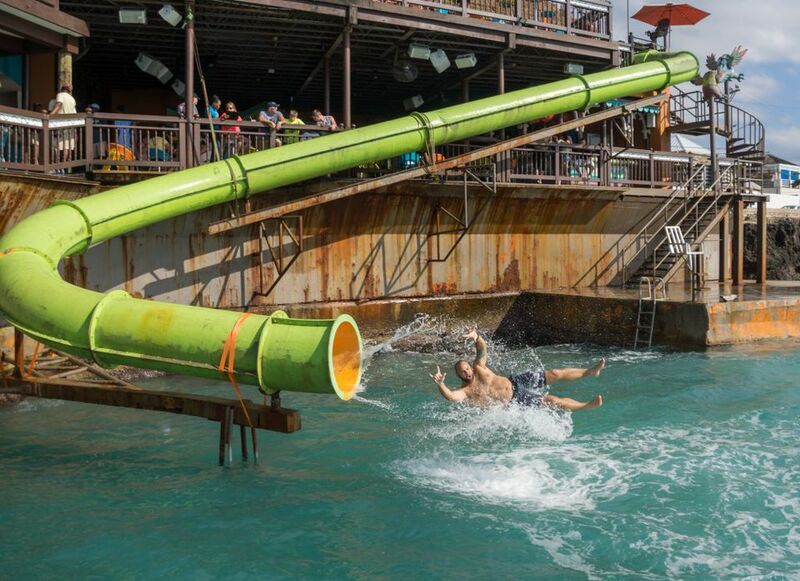 During the day, there is a 120-foot waterslide that winds down from the rooftop terrace and flings tourists into the warm water below, but by night it is wisely off limits. On any given night the place will be wall-to-wall people, dancing, drinking and having the most marvelous time on the dance floor before the requisite giant shark head. Over the years, Margaritaville has entertained superstars such as rappers Nelly, Busta Rhymes, Jermaine Dupree, P.Diddy and Run DMC, and has seen big-name celebrities including the late Dennis Hopper, Cindy Crawford, Lance Armstrong, Tiger Woods, and Uma Thurman. The Montego Bay Margaritaville is located in the middle of MoBay's famous Hip Strip, the center of nightlife for locals and tourists alike. It's within walking distance of some resorts and a short cab ride from the cruise pier and other area resorts. Dining is pretty much what you'd expect at a Margaritaville -- lots of burgers, jerk chicken, and mildly island-themed munchies. Next door, however, you can up the fancy ante at Marguerite's, a sister restaurant with white-tablecloth terrace dining on fresh local seafood. These days, you can find Margaritaville hotels and resorts all over the U.S., but some of the most unique locations -- like the one in Montego Bay -- are found in the Caribbean; it's their spiritual home, after all! Margaritaville Caribbean also owns the longstanding Margaritaville in Negril as well as the newer Falmouth, Jamaica location, conveniently set on the city's cruise-ship pier. You'll also find Margaritavilles in Ocho Rios, at the cruise port in Grand Turk, Turks and Caicos, and in the heart of George Town, Grand Cayman -- also a quick stroll from that town's cruise port. For travelers heading through the Montego Bay airport, the friendly Air Margaritaville restaurant in the terminal is your first -- or last -- chance to grab a rum drink on your vacation. Cost: Cover charges vary by night and event, check the website for updated information.